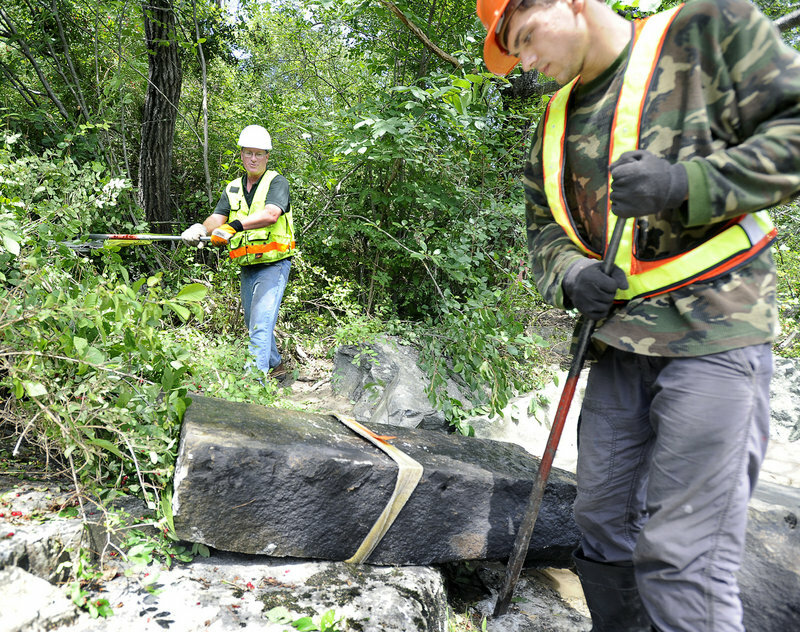 A three-day cooperative effort has begun to remove 25 granite blocks that once formed a dam on the Yarmouth waterway. And advocates hope it's just the beginning. YARMOUTH — With steel cables, a grip hoist and a lot of sweat, the first fish-passage restoration project on the Royal River got under way on Tuesday. The three-day project will remove a tumble of 25 massive granite blocks that once formed an old dam across the narrow back channel at Factory Island. Jed Wright, left, from U.S. Fish & Wildlife, works a winch as Cecil Cates uses a crowbar during the restoration project Tuesday on the Royal River. The $5,000 project is funded largely by a grant from the Casco Bay Estuary Partnership, an agency that works to restore fish passages in the bay’s vast watershed area. Courtesy TJD&A Taken in April 2008, this is one of the last known photos of the former granite bridge to Factory Island on the Royal River in Yarmouth. Tom Farmer, a landscape architect at Terrence J. DeWan & Associates in Yarmouth, was studying the area for a river corridor plan. The bridge, likely built decades ago as a dam with wooden spillways, collapsed into the river sometime after 2008. The effort joins local, regional and federal agencies in a small but important project that supporters hope will encourage the removal of larger dams at East Elm Street and Bridge Street, said Landis Hudson, executive director of Maine Rivers. With each crank of the grip hoist, granite blocks as large as refrigerators inch slowly out of the channel and come to rest on the wooded riverbank. Each one weighs 4,000 to 8,000 pounds. Removing the granite blocks will restore the back channel as a natural passage around Middle Falls and Factory Island, Hudson said. It will benefit so-called resident fish that live between the East Elm Street and Bridge Street dams, including white suckers, bullheads, creek chubs and common shiners. River advocates say removing the larger dams would invite ocean fish such as alewives, salmon, shad and striped bass to return to the river to spawn. The small dam was built more than 100 years ago, Hudson said. It probably included wooden spillways that controlled water levels when the Forest Paper Co. mill straddled Middle Falls in the early 1900s. More recently it was used as a narrow footbridge to Factory Island, where remnants of the mill still stand. 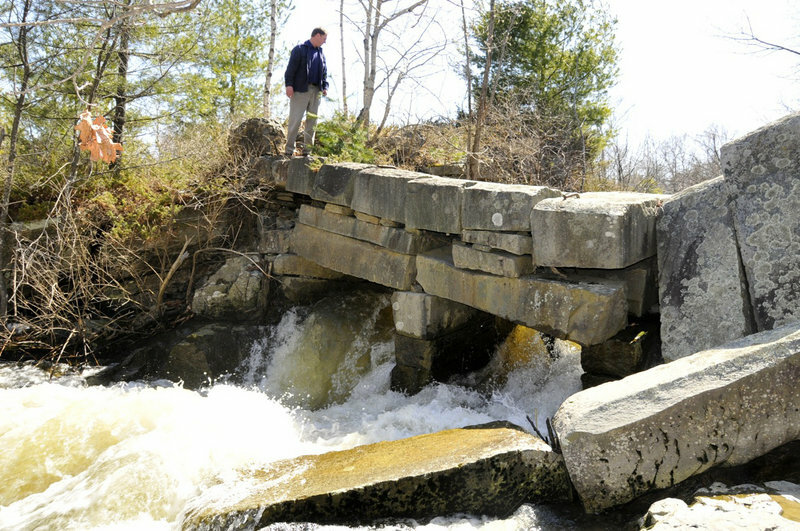 The small dam toppled sometime after 2008 — the year TJD&A Landscape Architects in Yarmouth prepared a river master plan that recommended removing or restoring the structure. Hudson blamed the dam’s demise on ice, gravity and time. The $5,000 project is funded largely by a grant from the Casco Bay Estuary Partnership, an agency that works to restore fish passages in the bay’s watershed area, which ranges from Cape Elizabeth to Bethel to Phippsburg. The Royal River’s watershed covers about 141 square miles, flowing out of Sabbathday Lake in New Gloucester and traveling more than 25 miles to Casco Bay. “We are improving the river an inch at a time,” said Matt Craig, the partnership’s habitat restoration coordinator. Additional muscle and expertise for this week’s effort are being provided the Gulf of Maine Coastal Program, an arm of the U.S. 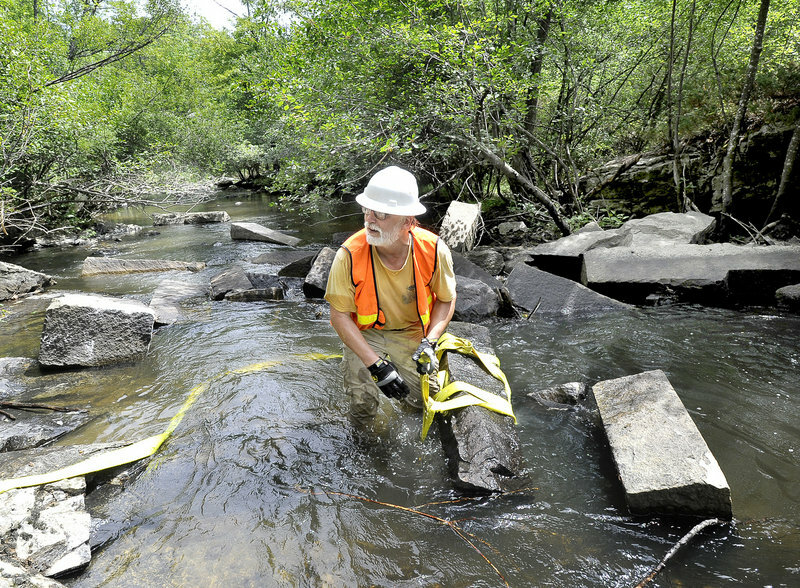 Fish and Wildlife Service, and Project Share, which restores salmon habitat in Washington County. The groups are working together and sharing limited financial resources to restore thousands of fish passages across Maine, said Steven Koenig, executive director of Project Share.